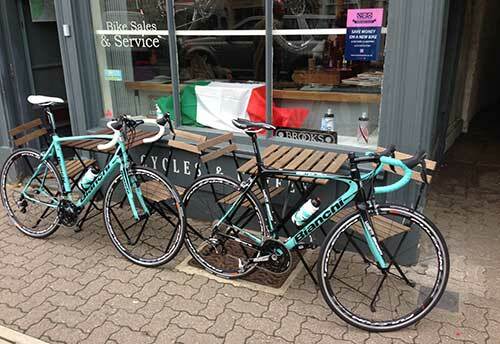 This was the picture on the 30th May 2014… two brand new Bianchis propped up outside Veloton in Tetbury ready for their first spin home. On the left is an Intenso and on the right my Sempre Pro – two weeks previously the order had been for identical bikes, two Intensos, but I’m glad I swapped to the Sempre (more on the decision processes in another post). 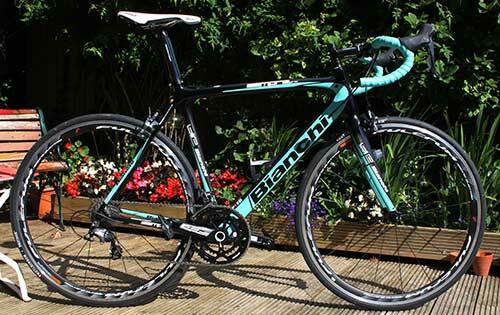 Two months on and the Sempre is proving to be faultless. It’s race geometry is proving to be forgiving and hasn’t resulted in any permanent aches – I’ve got a couple of spacers left in the headset stack, so the bars are slightly raised mid-way, but it’s definitely lower than my Cannondale was set-up. The only slightly disconcerting thing is the occasional sharp crack, as one of the internally routed cables slaps against the inside of the frame over a bump. In terms of rides, it got me through a 90km outing on Sunday quite happily and quite a few two hour outings have sailed past… no problems with bike or rider. But it was last night’s group riding session at Castle Combe with Chippenham Wheelers where the Sempre seemed to find it’s spiritual home. Bowling around the race track at 30km/h in a group of eight riders, learning how to change positions in a chain gang, highlighted how effortlessly the Sempre covers the ground. Aside from increased respect for the riders in a pro-peloton (this is the first time that I’ve done any ‘formal’ chain gang work), this showed why some of the pro and semi-pro teams are using the Sempre as an alternative to their Oltre and Infinito bikes on some of the more challenging stages. Update – 5th January 2015 – I’ve been running the Sempre for nearly nine months and it’s proven to be sublime. There’s more details on the 2014 Summary post. Previous PostThe Keep Calm T-Shirts are coming! Next PostKeep Calm And Peloton – Probably the best cycling shirts ever?